The kids are back to school! Yay! Mine are all grown up now, but I remember it well. With back-to-school comes all sorts of new activities and responsibilities, but also an influx of PAPER into your house. Forms to fill out, newsletters, home work, and the ever-abundant artwork. That little budding Picasso put their heart and soul into that creation, and it should be displayed for all to see, right? And, what about those math tests with an A+ scrawled across the top in red pen? We want to see those too! So, now comes the question of WHERE. How do we display these important papers without wallpapering the refrigerator with them? I think as long as that appliance has been around, that’s how long they’ve been hidden under a blanket of papers, and I don’t care how neatly you try to arrange the display, or what fun little magnets you have, it somehow always looks messy and cluttered. 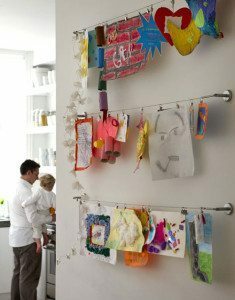 It’s a place to store food, and wasn’t really designed to double as a bulletin board, so if your refrigerator is covered in papers, notes and pictures, it can actually become the focal point of your kitchen. Frame It! ~ One idea for displaying artwork is to buy inexpensive frames and create a wall grouping. 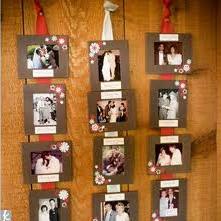 With frames like these shown above, you can easily swap them out in a matter of minutes! I like that these frames are just clear class with no backing, so it really makes the art prominent. One rule of thumb for doing any grouping is to have all the frames identical. This way, you focus on the art, not the frames. Clip It! ~ If you want an even easier way to swap out the school papers, try clipping them to a decorative ribbon hanging on the wall. I couldn’t find an image with kids’ school work, but this one with photos gives you the idea I’m thinking of. Now that they make binder clips in cool colors, you could have a little fun with this! I think this clothesline idea below is especially cool, and I found this wire curtain rod at IKEA that would work perfectly! Add the clip rings too, and for $20 bucks, you’re all set! I hope you found these ideas helpful! If you’re feeling a bit stuck with how to have all your kids’ stuff in the house, yet still make it feel like an adult space, my Designer Download© session can help! It’s one session, with lots of answers, at one affordable price. These are VERY cool ideas. I love it because it also helps people to stay better organized which also makes for less stress. I do have to say though, as a person who goes to a lot of different homes on a regular basis, I do always love reviewing the refrigerator pics. Something very nostalgic about it, for me, I think. Even though I have a 17 year old son who is in high school, I still end up with oodles of papers on the fridge! 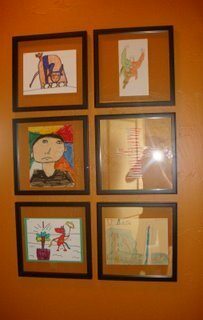 I have a huge tub of my son’s artwork from when he was younger and these are awesome ideas for how I can pull some of it back out and enjoy what he did when he was younger in an organized and artful way. I’ve taken your advice of using frames that are similar to accentuate the art – thanks Kathy! Kathy- these are very good tips. I also like the idea of scanning the artwork into your computer and then you can make digital artwork to send to Grandma & Grandpa or your favorite Aunt or Uncle, or other family members. And as an added bonus you don’t have to physically save all that paperwork!